Artistic Expression - Fizz Boom Read! If anything is able to "Spark a Reaction" it's art. Art can cause others to react with joy, with sadness, with rage, and even disgust. To have another person react strongly to art is essential to an artist...not to mention that art and science can sometimes even go hand in hand. As suggested in the manual, you can offer a program where teens make their own musical instruments from objects, or you can have stations set up with pre-made instruments for teens to try. 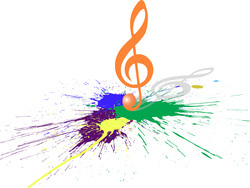 Either way, showing them creative ways to make music is sure to be popular! The manual also suggests that you might want to have a performance for teens with finished instruments--this depends on your population. If you have a group you think won't be too shy--go for it! You can either invite the public, or offer an impromptu performance in an open area of your building where patrons can enjoy the performance. Several easy, 5-note songs are suggested. See 5-Note Songs for more details. For your teens who don't read music, remember to label the notes on your instruments as well as labeling the corresponding notes on the sheet music. To make music reading easier, you could also use colors, as is done with this *Rainbow Water Xylophone. *Altoids Tin Guitar: This project is more advanced, but if you don't have a teen population that can handle tools, you could consider pre-drilling to make the project easier. *Simple Xylophone: If you could get a hardware store to partner with you and donate supplies, this could be a super fun instrument to make and play! Crayons aren't just for kids anymore! The manual suggests melted crayon art for your summer fun. This is a great project for teens who aren't all that artistically inclined to make something really creative. 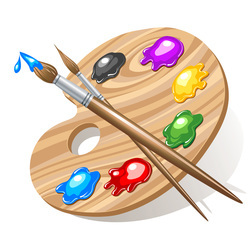 For those who are artistically inclined, all the better! The manual walks you through step-by-step how to create melted crayon art with your teens. 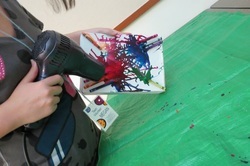 Just one note for adaptability--if you can't afford to purchase canvas for your teens and you can't get it donated, this fall the Council Bluffs Public Library did melted crayon art using primed cereal boxes and it worked wonderfully! *You might also consider trying something new and crafty with your duct tape--like a boat contest! See the Teen Apocalypse Bug-Out Bag for details. To make duct tape programs more affordable, be sure to call around to local hardware and craft stores. And don't leave out national chains like Home Depot, Menard's, and Wal Mart. 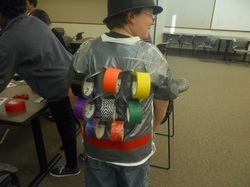 Designer duct tape is for sale all over the place these days and if you can get several businesses to donate, you can pull off this program for free! Pendulum painting is a great program for teens because it allows even those without any artistic talent to create an awesome and creative piece of art. Depending on your population and the amount of time you have for your program, you may even be able to have the teens build their own tripods so that they are involved in the full process. You can keep costs down for this project by asking your patrons to donate their empty glue bottle and empty plastic bottles on your library's Facebook page. You might also have a local hardware store willing to donate items like rubber feet in exchange for recognition on your publicity. 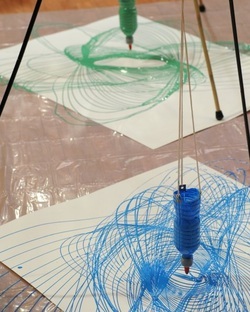 For a full tutorial, please see Martha Stewart's Step-by-Step Pendulum Painting. *Post-It Note Art Show: This could be an ongoing display or a program where post-it notes are submitted over time and then you have an art-show style opening reception, leaving the post-it art on display in the library afterward. *Public Art: The Whitney Museum asked teens to collect scraps of paper with an answer to the question, "What are you waiting for?" You could do that question, or any other question you like! Exploding Sidewalk Chalk Paint: This is actually a blog post on a pre-school project, but teens would have a blast with this! You could make it into a contest or just use it as a messy and awesome opportunity to decorate the sidewalks around your library.